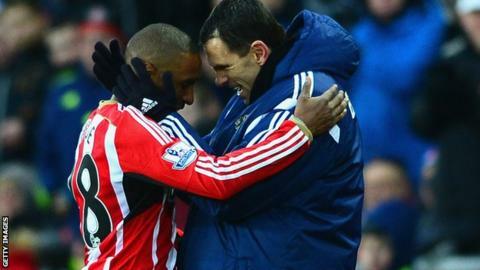 Jermain Defoe scored his first goal for Sunderland as the Black Cats eased clear of the Premier League relegation zone with victory at home to Burnley. Connor Wickham opened the scoring on 20 minutes with a firm header following a clinical Sunderland attack. Another well-worked move created the second as master poacher Defoe turned in Patrick van Aanholt's centre. The wins lifts Gus Poyet's Sunderland up to 14th place, four points clear of the drop zone. Burnley boss Sean Dyche was able to name an unchanged team for the ninth successive league match, and almost saw his settled line-up nose ahead when Ashley Barnes headed wide from a free-kick. Sunderland's goalless FA Cup draw with Fulham last week was greeted with boos at full-time, prompting Poyet to bemoan a "missed connection" with the fans. The need to impress at the Stadium of Light - where the Black Cats had won just once in the league all season - was therefore in his mind before this game, and the hosts duly hit the front with a stylish goal midway through the first half. This was the 100th league meeting between the two teams, with Sunderland's victory count now standing at 41. Burnley last won a league match away at Sunderland in 1972. Sebastian Larsson's strength and vision created the opening for Anthony Reveillere to send over a perfect cross for Wickham, who headed back across the scrambling Tom Heaton and into the far corner for his third league goal of the season. Sunderland's connection with the home faithful further solidified when more incisive approach play made it 2-0 on 34 minutes. Jordi Gomez sprung the offside trap with a cute lofted pass to the advanced Van Aanholt, who controlled and picked out Defoe to apply a simple finish. The strike was Defoe's first in three games since arriving at Sunderland from Toronto FC earlier this month - and first in English football since scoring in Tottenham's 2-0 win over Crystal Palace on 11 January last year. Another of the strikers on show, Burnley's Danny Ings, endured a frustrating afternoon in the week that the Clarets firmly rebuffed Liverpool's supposed advances towards the 22-year-old. Aside from one surge forward that ended with a half-chance for strike partner Barnes, Ings was largely anonymous and made way for Lukas Jutkiewicz with half an hour to go. "It was important that we got the win today. It was a massive win. We created a lot of chances, the fans were fantastic. The energy from start to finish was fantastic. We managed to get the early goal which helped us, settled us down. "The Premier League is the best in the world and that's where you want to be. I feel like I have a lot of goals left in me." "The players on the pitch knew how important it was but we don't need to think we are OK - we need to go to the next level. I want this to be a turning point. I hope we will go into the next game with the confidence we were looking for." Match ends, Sunderland 2, Burnley 0. Second Half ends, Sunderland 2, Burnley 0. Costel Pantilimon (Sunderland) is shown the yellow card. Attempt saved. Jason Shackell (Burnley) header from the centre of the box is saved in the top centre of the goal. Assisted by Ross Wallace with a cross. Corner, Burnley. Conceded by Sebastian Larsson. Ricardo Álvarez (Sunderland) wins a free kick in the defensive half. Attempt blocked. Liam Bridcutt (Sunderland) right footed shot from outside the box is blocked. Corner, Sunderland. Conceded by Kieran Trippier. Danny Graham (Sunderland) wins a free kick on the left wing. Corner, Sunderland. Conceded by Lukas Jutkiewicz. Substitution, Sunderland. Ricardo Álvarez replaces Adam Johnson. Attempt missed. Sam Vokes (Burnley) header from the centre of the box is close, but misses to the right. Assisted by Ross Wallace with a cross. Lukas Jutkiewicz (Burnley) wins a free kick on the right wing. Attempt missed. Ben Mee (Burnley) header from the centre of the box is close, but misses to the left. Assisted by Ross Wallace with a cross following a corner. Corner, Burnley. Conceded by John O'Shea. Offside, Burnley. Sam Vokes tries a through ball, but Lukas Jutkiewicz is caught offside. Offside, Sunderland. Patrick van Aanholt tries a through ball, but Adam Johnson is caught offside. Corner, Sunderland. Conceded by Ben Mee. Substitution, Burnley. Sam Vokes replaces Ashley Barnes. Substitution, Sunderland. Danny Graham replaces Connor Wickham. Attempt missed. Sebastian Larsson (Sunderland) right footed shot from long range on the left is just a bit too high from a direct free kick.